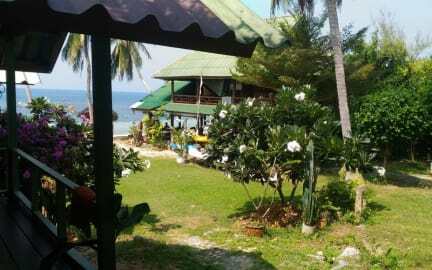 Seaside Bungalows is a simple traditional Thai beachfront resort located on Haad Rin Nai ( Sunset ) beach. With Haad Rin village centre and Sunrise ( full moon ) beach just a short 10 to 15 minute walk away, you're never far from the night-life. 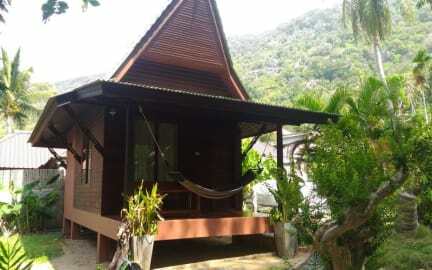 The location of the bungalows though, provides peace and quiet at night time ensuring a good night's sleep. The bungalows have long been established as a place where people want to enjoy the real Thai culture and of course, the beach-front location makes it a real winner for those of you wanting to enjoy those sun-drenched beach days. Basic Double - The basic double bungalows are Fan cooled and come with one large bed. Basic Twin - The basic twin bungalow is Fan cooled and come with two single beds. Standard Double - The standard double bungalows are Air Con and come with one large bed. Standard Twin - The standard twin bungalow comes with Air Con and two single beds. Standard 3 Bed - The standard 3 bed bungalows are Air Con and come with one large and one single bed. Standard 4 Bed - The standard 4 bed bungalow provides Air Con and 4 single beds. Ideal for backpacker groups looking non bunk bed style rooms. All bungalows have basic furnishings and provide en-suite bathrooms with hot showers, a balcony or terrace and outdoor furniture. All bungalows come with hammocks to relax in. Our family run resort has it's own sunset bar & restaurant serving both Thai and International cuisine. Happy hour operates from 5-7pm every day when customers can enjoy the stunning sunsets along with discounted drinks. Travel and tours can be booked with us and and guests are collected by taxi at the resort entrance. The staff are always very polite and being locals can give you all the information you need to make your Koh Phangan experience a safe and pleasant one. Nice and quiet little place near the ocean if you want to relax for a couple of days. Do consider that there is not a lot of stuff to do on this part of the island, so grabbing a cab or renting a scooter is neccesary if you want to enjoy more nightlife. There is no pool, however, you are free to use the pool of a bungalow park 100 meter further down the beach. We enjoyed our stay here! Super friendly owner. We got only one mosquito net for 2 beds, so we had to stretch it out so far that it did not cover everything.